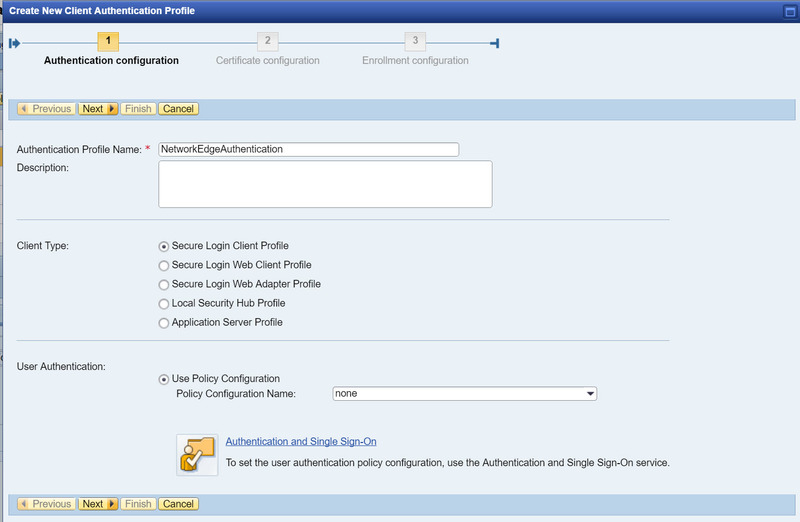 With ABAP 7.51, a new authentication scenario was announced: Network Edge Authentication. This is a great new feature for securing http-based access to your systems. This blog will guide you through the implementation, using x509 certificates as token type, in the different systems. The SSOAUTHLIB provides the authentication and certificate fetching mechansim, while the SECURELOGINSERVER provides the certificate signing functionality. Create an empty authentication stack in the NWA, called for example “none”. Choose a name for the profile. This name is later referenced in the NEA endpoint configuration. The client type has to be a client, the user authentication does not matter (the user authentication is done at a nea-endpoint, not the endpoint created here). Select for example “Secure Login Client Profile” and select the empty logon stack created above. 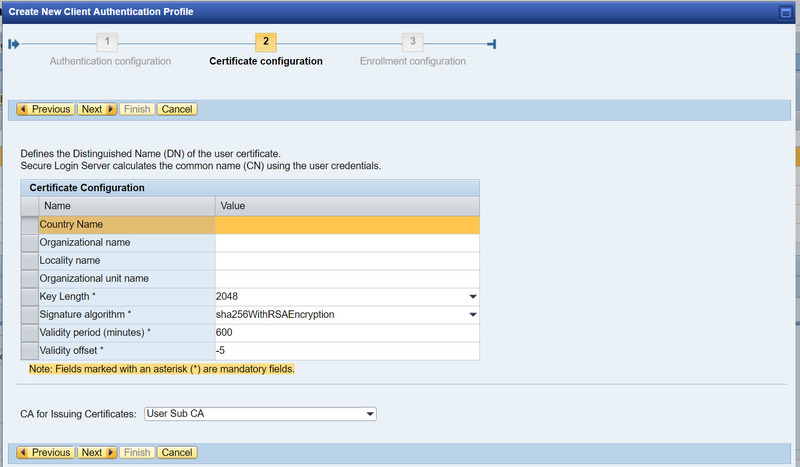 The certificate configuration can be kept at the default. The DN is always “CN=<Username>”. Just make sure, that the selected CA is the User CA. The enrollment configuration can also be ignored and the configuration can be finished here. If you don’t specify a template, the default stack (usually “ticket”) is used. You can also configure a NEA specific stack (as in the screenshot) or a completely individual stack. Within the properties of the policy, set the property “x509_sls_profile_name” to the name of the SecureLoginServer Authentication Profile created in the previous step. This concludes the configuration in the SSO System. In the Webdispatcher, there are two types of systems in a NEA-configuration. These systems reference the Auth-System in their configuration. So requests only reach these systems, if they are already authenticated with the Auth-System. All these systems are configured by subparameters of the wdisp/system_<x> parameters. So the systems themselves are connected in the established manner. Important: Routing in a NEA scenario has to happen via “SRCVHOST” subparameter (and optionally SRCURL subparameter). See note 2432861. To configure the Auth-System, the subparameter “AUTH_SERVICE” is pointed to the NEA enpoint (usually https://<host>:<port>/nea/v1/authenticate). Any not authenticated is redirected to this service. The host/port is the host and port of the SSO system on the Webdispatcher. In addition, the DOMAIN_RELAX cookie should be set at least to 1 to ensure, that the Webdispatcher Session Cookie is valid for other systems than the SSO system. The signed client certificate is necessary, because the Webdispatcher needs to authenticate at the backend to forward the client identity. In the backends, client certificate based authentication needs to be enabled. This means, that all backend systems have to have HTTPS enabled. With these settings the HTTP Headers containing the user certificate are evaluated. Mapping the user certificate to the user is done in the usual way. In an ABAP stack it is recommended to use transaction certrule and create the needed rule. In a Java Stack, the rule is created in the login module. If you want to double check the certificate that is coming in, use the icm/HTTP/logging parameter to create a log containing the request headers. In addition, if there are any cryptography errors, you may find some information in the common crypto lib traces (see note 1996839 and 2338952). All the best for your configuration. Next (CTS +) Finally In SAP Cloud Platform- IS!